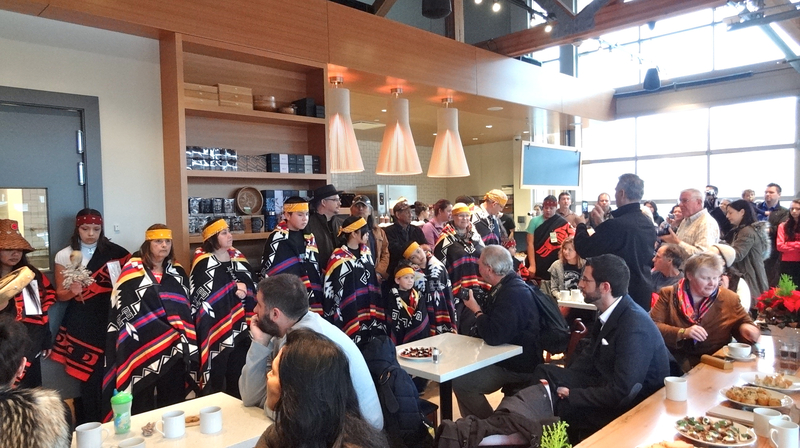 This morning the Fort Langley community celebrated the opening of a beautiful new coffee shop on the riverfront. The LELEM’ Arts and Cultural Cafe operated by Seyem’ Qwantlen was launched with a traditional Kwantlen First Nation ceremony. The cafe, located on Billy Brown Road, overlooking the Bedford Channel, will serve local organic cuisine with a First Nations twist and JJ Bean specialty coffees. “LELEM'” means “our home” – a place to gather. Meet you at lelem’ on the Fort to Fort Trail! This entry was posted in Brenda and Kurt Alberts about town, Fort Langley Village News, Gallery Artists in the news, Heritage Matters, King Richard Brodeur. Bookmark the permalink.